GBP is under pressure due to poor economic data yesterday such as The UK’s CPI reading. USD has been getting empowered after the Turkey crisis and the strong economic reports. 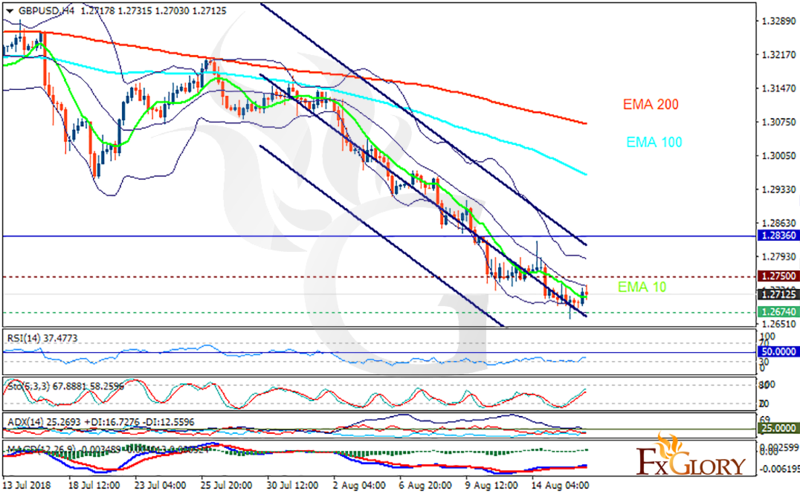 The support rests at 1.26740 with resistance at 1.27500 which both lines are below the weekly pivot point at 1.28360. The EMA of 10 is moving with bearish bias in the descendant channel and it is below the EMA of 200 and the EMA of 100. The RSI is rising towards the 50 level, the Stochastic is showing upward momentum and the MACD line is above the signal line in the positive territory. The ADX is not showing any clear signals. The indicators are showing bullish signal. The price may grow towards 1.278 but the bearish pressure remains.